LOS ANGELES, California (CNN) -- Singer Chris Brown, sought by Los Angeles police after an alleged domestic violence incident, turned himself in Sunday, police said. 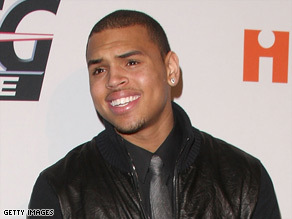 Brown, nominated for two Grammy Awards, was a no-show Sunday night at the nationally televised awards show. He was scheduled to perform at the show. Police have not identified the alleged victim, who they said "suffered visible injuries and identified Brown as her attacker." The introduction to the CBS broadcast of the Grammys, apparently pre-taped, listed both Brown and Rihanna as performers.